A momentous event one hundred years ago marked the beginning of a new era in the economic and social life of the Red River Settlement. It was the arrival of the first steamboat ever to reach the settlement and it caused a great deal of excitement. On Thursday, 10 June 1859, the settlers, Metis, and Indians were astonished and frightened to hear the first steam whistle sounded here. They rushed to the landing at the Hudson’s Bay Company’s Fort Garry, children screaming and dogs barking. The great bells of St. Boniface Cathedral chimed merrily, the officers of the fort ordered the cannon to be fired and hoisted the British flag to greet the “Stars and Stripes” waving at the head of the SS Anson Northup. 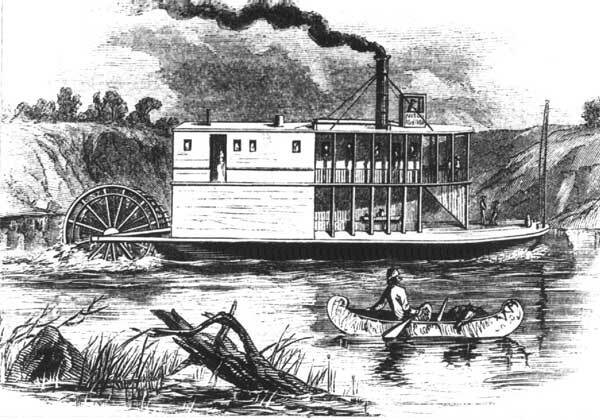 On this run only two or three passengers were aboard as the Captain and owner of this small, shabby sternwheeler, Anson Northup, was primarily concerned with reaching Fort Garry as soon as possible. He was anxious to secure the prize money offered by the St. Paul Chamber of Commerce to the first person bringing a steamboat to the settlement. According to the Earl of Southesk, visiting Fort Garry at this time, crowds of Indians stood on the shore, watching the arrival of this strange object. Later, Indians protested against the whistle of the steamboats as they said it would drive away the game and disturb the spirits of their dead. They demanded four kegs of yellow money (gold) to quiet the spirits of their fathers. Finally, it was agreed that the whistle was to be blown only on arrival in and departure from Georgetown, Pembina and Fort Garry. Filled to capacity with about fifty passengers the boat took an excursion trip down the river to Lower Fort Garry on Sunday, 13 June. One of them said: “It was a perfect circus all the way to see the surprise of the Indians.” Children described it as an enormous barge with a watermill on its stern. A week from the time of arrival, the SS Anson Northup left for Fort Abercrombie, in Dakota Territory, taking twenty-five passengers. They were eight days in reaching their destination as they had to stop at nights, because having only lanterns they found it difficult to see the shore line. Cutting wood for its engine which used a cord an hour also used up time. Later, Indians supplied this wood and their fueling bases often became the sites of new towns. Captain Northup sold his boat to J. C. Burbank for $8,000 and hastened on to St. Paul to receive his prize money. While waiting for a new Captain, the boat was used as a ferry at Fort Abercrombie until August. The new Captain, Edwin Bell, then navigated it to Fort Garry where it was laid up for the winter at Cook’s Creek. An engineer was sent from St. Paul to inspect the boat’s boiler. On his way north, his guide, James MacKenzie, a native of the Red River Settlement, became separated from the party and was frozen to death. The SS Anson Northup had to be practically rebuilt during the winter of 1859-1860. Then it was renamed SS Pioneer but as such it had a short life. It sank at Cook’s Creek in the winter of 1861-1862. Its engine was taken to Grand Forks and used in a sawmill. The SS Anson Northup had been built from parts of an older boat whose machinery, cabin and furniture were transported overland from Crow Wing to the Red River. In 1861, parts of a second old Mississippi River boat were brought to Georgetown and built by the Hudson’s Bay Company into a fine new boat. It was called the SS International and arrived at Fort Garry on 26 May 1862. After this traffic became heavy on the Red River, and still later steamboats were built to nagivate the Assiniboine and Saskatchewan Rivers as well. It was not until 1909 that the last steamboat ran from the United States to Winnipeg, thus bringing to a close fifty years of international steamboat traffic.